Hospice Chaplain Sam Aylor, M.Div, was selected to the Oregon Hospice Association’s Dream Team last month at its annual conference. Aylor is Housecall Providers’ fourth member to join the team, following in the footsteps of Volunteer Coordinator Todd Lawrence (‘13), Certified Nursing Assistant Yana Kasim (‘14) and Medical Director Dr. Nancy Cloak, HMDC (’16). “There is a reason why several of my colleagues at Housecall Providers have received this award, and why I know many more will receive it in years to come,” Aylor says. The Hospice Association invites member agencies to submit Dream Team nominations for staff members whose contributions improve the access to and the quality of hospice and palliative care in their communities. Aylor, who has been with Housecall Providers Hospice for just under two years, has become an invaluable member of the hospice team. 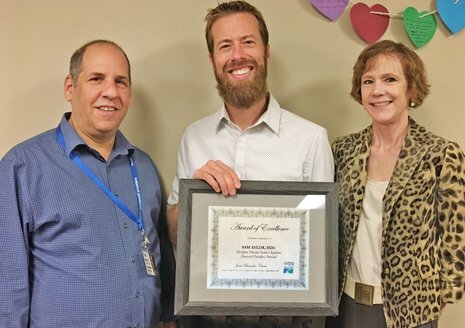 His colleagues consistently report that he shows up at just the right time to care for patients’ and families’ needs and provides support for his fellow staff throughout the organization. Joining Aylor on the 2017 Dream Team is Hospice Physician: Stephen Kerner, DO (PeaceHealth Peace Harbor Hospice in Florence); Hospice Nurse: Janine Carranza, RN (Lumina Hospice & Palliative Care in Corvallis); Hospice Volunteer: Curt Seelilger (Lumina Hospice & Palliative Care); Hospice Aide: Amanda Bryan, CNA II (PeaceHealth Peace Harbor Hospice); Hospice Aide: James McGaha (Care Partners in Hillsboro); Hospice Social Worker: Anne Hovland, LCSW (Samaritan Evergreen Hospice in Albany).